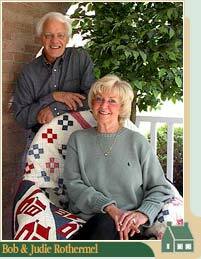 My husband Bob and I have owned and operated the Schoolhouse Quilt Shop in Canton, Ohio since 1976. Running the Shop inspired me to collect, study and write about antique textiles. I’ve learned much through extensive reading and researching fabric collections in institutions such as The Shelburne Museum in Vermont and The DAR Museum in Washington. I’ve had the opportunity to design fabric collections for Marcus Brothers Fabric, Inc since 1987. Using my knowledge of antique fabrics and my collection of unique textiles as both a guide and inspiration, I’ve been able to release at least eight collections of 100% cotton quilting fabrics each year. It is interesting that each new project seems to come from a personal interest or desire of one of our customers. Some of my more notable collections include Aunt Grace, Baltimore Album and various Civil War prints. What makes these collections special is that they can all be coordinated to work with one another giving you many options to choose from when making your own quilts. Currently I am focusing more on designing quilting fabrics for Marcus Brothers, Old Sturbridge Village Museum in Sturbridge, MA, and American Textile Museum on Lowell, MA, as well as writing books and promoting our website. Even so, I will still be available to take your calls and fill your requests at Schoolhouse Quilt Shop.